This is a highly nutritious, completely balanced formula for the Racing Homer. The special blend and ratios of corn, peas, beans and small grains gives you ultimate performance whether you are conditioning the birds for breeding, or preparing a racing program. Super Mix should not be fed as a raising food, due to high content of large corn and beans. 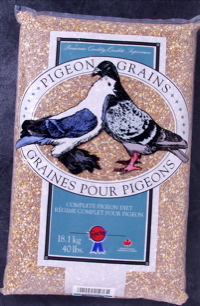 There is a danger that young birds could choke or damage their throats on these coarse grains. Super MIX should never be fed to small beaked pigeons such as Rollers, Tipplers or Owls, as the mixture is too large and coarse for these birds. Dent corn, white peas (small), milo-red, wheat (hard western), faba beans, maple and/or austrian peas, tares.